Dustin Cabeal is a writer and founder of comicbastards.com. 'Comic Bastards’ goal is a simple one: to help comic book readers of all kinds discover the world of comics, but most important of all indie comics. It's a web portal with reviews, podcasts, press release about Comic and Manga. 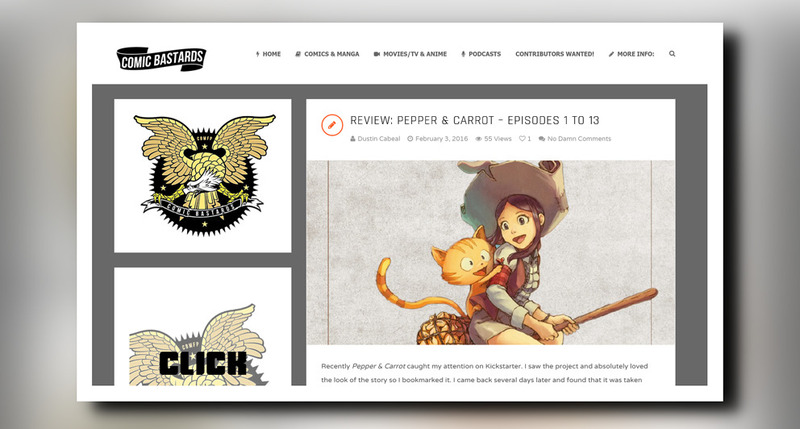 I was happy to discover the review of Pepper&Carrot: all informations are accurate and I really liked the nice words about Pepper&Carrot ( and 5/5 score, yay! ). Thank you! An indie comics review site. Sweet! Nuff with the mega super heros. More with the indie. Thanks for the tip. And congrats! I just recently discovered your comic this week (and loved it). This review is encouraging me to go back and read more. Well, that review was a lot of empty words. But it was nice that P&C was noticed that way.